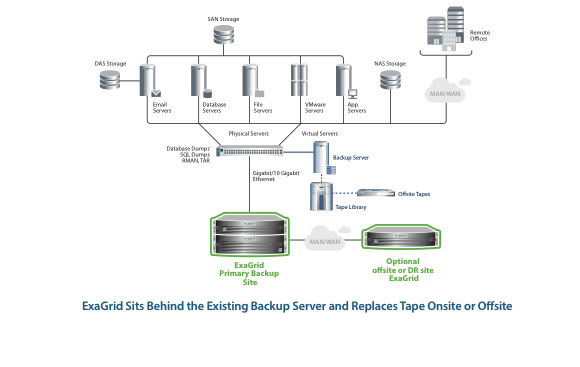 ExaGrid delivers better backups using the only hyper-converged secondary storage (HCSS) for backup with data deduplication purpose-built for all leading backup applications that leverages a unique architecture optimized for performance, scalability and price. ExaGrid customers achieve the fastest backup times as data is written at the speed of disk and the most recent backups are stored in their complete undeduplicated form for fast restores, fast VM instant recoveries, and fast offsite tape copies. ExaGrid delivers the fastest backup performance for the shortest backup window and maintains a fixed length backup window as data grows by adding full appliances into a scale-out system. ExaGrid appliances work seamlessly with industry-leading backup applications and database utilities by presenting themselves as standard NAS shares (CIFS or NFS), a Veeam Data Mover target, or Veritas OST target. ExaGrid appliances are easily integrated into existing backup environments, as illustrated below.